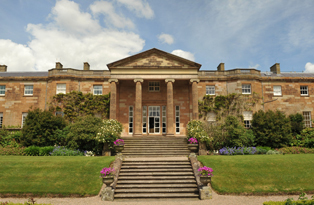 The late Georgian mansion, Hillsborough Castle, was built in the 1770s by Wills Hill, first Marquis of Downshire and was later remodelled in the 19th and early 20th centuries. Today, it is a working royal palace functioning as the official residence of the Royal Family when they are in Northern Ireland, and it has been the home of the Secretary of State since the 1970s. A tour of the house will guide you through the elegant State Rooms, still in use today, including the majestic Throne Room and graceful Drawing Room. Discover the more personal side of the castle at our new exhibition. Visit the Downshire Gallery in the palace to see portrait photography of the people, great and small, who have visited Hillsborough, from queens to choir boys, politicians to pot washers.